Scottish clan Mac Dhubhich, or Mac Duffs. Home » Scottish clan Mac Dhubhich, or Mac Duffs. MAC DHUBHICH, OR MAC DUFFS. Mac Dhubhich or Mac Duffs. THIS surname is one of the most ancient in Scotland, and the chief was among the first of those nobles who became distinguished by the Saxon title of Earl. Dubh, the bh having the sound of f or v, is the term in Gaelic descriptive of a black or dark coloured man, and all those who are of this clan refer to Mac Duff, the powerful Thane of Fife, who overthrew Mac Beth in 1056, as their common ancestor; but the first Thane was created anno 838*. Several other tribes in different parts, who have long been distinguished and independent clans, are also sprung from these great Celtic dignitaries, as the family of Mac Intosh and the noble house of Weems, who took the name from Eoin mòr nah-Uamh, great John of the Cave, who flourished 1140. The title Thane, which has been thought, by some writers, to come immediately from the Saxon, is a contraction of the Gaelic Tain-istair, a designation given to the governor or lord who acted as the representative of his king or chief in directing military operations and collecting the revenues then paid in cattle, under the name of Tain. The Thanes of Fife appear with high distinction in Scottish history, acting a prominent part in public transactions; and for the services rendered by the above Mac Duff, King Malcolm III., conferred on him and his posterity singular privileges 1. They were on all occasions, when the royal standard was unfurled, to have the leading of the van of the Scottish army. 2. They had the right of placing the crown on the heads of the kings at their coronation; and 3. 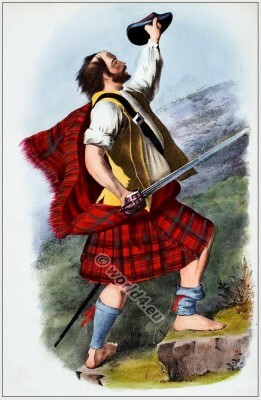 If they, or any of their kindred within the ninth degree, should chance to commit a slaughter, they should possess a special claim of girth or sanctuary, and obtain a free remission for the crime, on payment of an eric or atonement to the relations of those slain, which, in Scottish law, was called kinbot. This was settled at “nyne kye, and ane colpindach or young kow” for a gentleman which after the introduction of money, was commuted for twenty-four silver merks, and twelve for a common person. In order to obtain the advantage of this immunity, the party claiming it was obliged to satisfy a court appointed to be held a Cuper (Winston’s Chronicle); and Buchannan says, the custom was retained in the days of his fathers. The cross of Mac Duff in Fifeshire marked this sanctuary, and it bore a very curious inscription, in which Pictish, Gothic, and Latin are intermixed (Sibbald’s History of Fife and Kinross, 1710). Exercising the high privilege of her family, Isabell, who had married the Earl of Buchan, performed with becoming dignity and spirit the office which devolved on her by crowning King Robert the Bruce in 1306. Duncan the Thane had married Mary Monthermer, neice to Edward I., and took the side of the English and was governor of Perth; but, falling into the hands of the Scottish king, he and his lady were imprisoned in the castle of Kildrummy in Aberdeenshire, where he died, anno 1336. In Isabell, who was the only daughter of Duncan, the twelfth Earl of Fife, who was killed in 1353, terminated the direct line of the Fife Mac Duffs; and she dying without issue, in virtue of an entail made by her father, constituted, by deed of indenture, Robert, third son of King Robert II., her heir, both to the property and title, but the Earldom at last became extinct through the forfeiture of Murdoch, Duke of Albany, in 1425. The family being thus broken, the clan was dispersed, and the Duffs of the north arose, a succession of whom were respectable burgesses of Aberdeen, and other brunches obtained lands throughout these parts. William Duff of Dipple, in the county of Banff, was created a peer of Ireland by the title of Baron Brace of Kilbride, 1735, and being descended from the ancient Thanes of that title, he was created Earl of Fife and Viscount Mac Duff, also in the Irish peerage, by patent, April 26th, 1759. James, now Earl of Fife, was raised to the dignity ofa peer of the United Kingdom by George IV., April 27, 1827, and is the fourth in the revived peerage. His lordship is amply imbued with the spirit of his ancestors, his benevolence and affability being the theme of praise and gratitude in the north. He served with great distinction as major-general in the army of the Spanish patriots, and was wounded at Talavera, and at the sanguinary siege and storming of Fort Matagorda, where he was a volunteer. He has long abandoned the gaieties of courtly life, and resides unostentatiously at his princely mansion of Duffhouse, in the vicinity of Banff, where his beneficence is widely felt. The SUAICHEANTAS carried by the Mac Duffs is Lus nam breoileag, vaccinium vitis idea, red whortle berry. The PIOBAIREACHD, Cù’a’ Mhic Dim’, is a fine lament for one of this clan. There were many of this surname in the north of Ireland, where there is Baile Iamais dubh, or James Duff’s-town. Rothiemay, Balvenie, Dalgettie castles, Innes and Duff-houses, are seats of the Earl of Fife, and Mar Lodge is his beautiful residence in the Highlands of Aberdeenshire. On occasion of the visit of King George IV. to Scotland, Lord Fife attracted much notice by his Highland followers, a number of fine fellows who attended him in the olden way as Gillean ruith, or running footmen, preceding and surrounding his carriage and keeping up their speed to wherever his lordship might drive. The flourishing town and harbor near Banff were formed by the Lords Fife, and named Mac Duff; and near the handsome church, which they also erected, is raised a cross in imitation of the original obelisk which marked the place of sanctuary, and so long remained an evidence of their former greatness. *Father Weems, quoted by Mann, in the Spalding Club Transactions. This entry was posted in 1845, 19th Century, Scotland and tagged Tartan, The Clans of the Scottish Highlands, Traditional Scottish National Costume on 7/31/13 by world4.